Physics department is one of the oldest departments of PES College of Engineering, Mandya, established in the year 1962. It is located in the first floor of the Administrative Block. The department has very good infrastructure with a carpet area of 320 sq. meters consisting of two spacious laboratories, HOD's chamber, two staff rooms, a departmental library, an internet room and a store room. The entire department is newly renovated with modern amenities and the laboratories are well established with latest & modern equipments. The department offers Engineering Physics Theory and Laboratory courses for the First year B.E students of all branches. The Department has been getting excellent results both in theory and practical examinations. Welcome to the department of Physics at P.E.S. College of Engineering, Mandya. The department has well qualified and dedicated faculty members and supporting staffs. The Physics Department is committed to continuous improvement of the quality of education through enhancement of the staff and students potential. The department provides a unique opportunity to study the different exciting fields with guidance of qualified teachers. The staff members have very good interaction with students and all the teachers do student counseling. Staff members are also helping the students in their project work of various engineering departments. This ensures good academic performance of the students. The department has five faculty out of which one Professor (CAS), one sociate Professor and three Assistant Professors. Among them two faculty have Ph.D. degree specialized in different fields of Physics. They have published Twenty One (21) papers in National & International journals and Thirty Nine (37) papers presented in different symposia / conferences. The department has a good supporting Non-teaching staffs with one Asst. Instructor and three Helpers. There is good synergy between the teaching and non-teaching faculty. Dr. Shivalinge Gowda, Professor and HOD of the department and Dr. T. S. Shashikumar, Assistant Professor are involved in research activities. 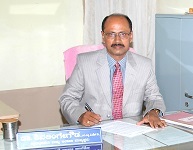 Dr. Shivalinge Gowda has guided nine students leading to M. Phil degree in physics.